Zlatan Ibrahimovic has called his former manager Pep Guardiola the 'most immature' manager he has ever worked with. Both Pep and Zlatan worked together in Barcelona before Ibrahimovic decided to join AC Milan after just one season at the Nou Camp. Ibrahimovic, who scored 16 times in 2 starts under Guardiola, has now accused the Spaniard of excluding him from his plans after the Swede questioned his tactics. "I went to talk to him. I'm here to talk, if you think it's for another reason then we can't talk. "The following game i was on the bench. I didn't say anything, i work. "Second match bench again. I thought he solved it well and he was not talking to me or explaining. Third match bench. Then the fourth match comes and bench again. 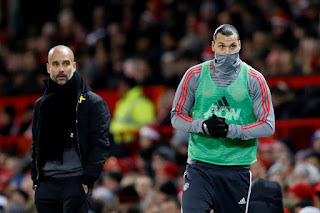 In his 2011 book "I AM ZLATAN", Ibrahimovic called Guardiola a 'Spineless coward' following a row over Barcelona's Champions League semi-final defeat to Jose Mourinho's Inter Milan.